Some years the end of October is a horrible nightmare of epic proportions. I cry constantly and have no ability to do anything other than wish I still had a mom. This year I've just been exhausted. Eyelids heavy, brain slow-moving, unwilling to use energy for exercise or figuring things out, so sticking to routines, or recipes, or work I already know. As I live through this new adventure, I wish I could talk to my mom about places I go, people I meet, possible jobs I read about. I wish I could go through the pro and con list of different options, and hear her advice about them. I love my friends and colleagues, both here and far away, and many of them have been great about patiently answering my questions and listening to my verbal processing, texting away at weird hours. But it isn't the same. And this is the time of year when I'm extra aware of how not-the-same it is. The position I'm in is tiring anyway, as my colleague keeps reminding me though I resist--knowing my current place is temporary, trying to discern where I'm meant to be for the next period of my life and work, learning how to live without a backup credit card or easy access to things I'm used to (like Minute Rice, or bactine, or white vinegar by the gallon, or the books I packed in the crate and now wish I could thumb through, or the purple scarf I must have packed but really wish I had here). But it hasn't felt exhausting until now, when I'm in the thick of searching AND the thick of October-ness. Now is when I wish I could talk to her, and am brought up short every time with the fact that I never can. So...yeah. This year I'm just tired. Needing a nap every day, going to bed early, sleeping in late, hoping my subconscious will let me catch a break from missing her. This is also the time of year when I remind people to have someone take photos at their ordinations, because I have none from mine (11 years ago this past weekend). But I also don't have many photos of my mom, or of us together. So I'll add this reminder: take pictures of people you love. And allow yourself to have your photo taken with people you love, because one day they might want those, and they won't care if you didn't like your hair or thought you needed to lose five pounds, or whatever. They just want you. Love you, mom, and miss you every day. Most of all today. The days are surely coming, says the Lord, when I will make a new covenant with the house of Israel and the house of Judah. It will not be like the covenant that I made with their ancestors when I took them by the hand to bring them out of the land of Egypt—a covenant that they broke, though I was their husband, says the Lord. But this is the covenant that I will make with the house of Israel after those days, says the Lord: I will put my law within them, and I will write it on their hearts; and I will be their God, and they shall be my people. No longer shall they teach one another, or say to each other, ‘Know the Lord’, for they shall all know me, from the least of them to the greatest, says the Lord; for I will forgive their iniquity, and remember their sin no more. Today is the third in our four week series on characters of the Reformation—we’ve heard already about Martin Luther and John Calvin, and next week we’ll hear about the great John Knox…today we are going to encounter some people who are less well known. 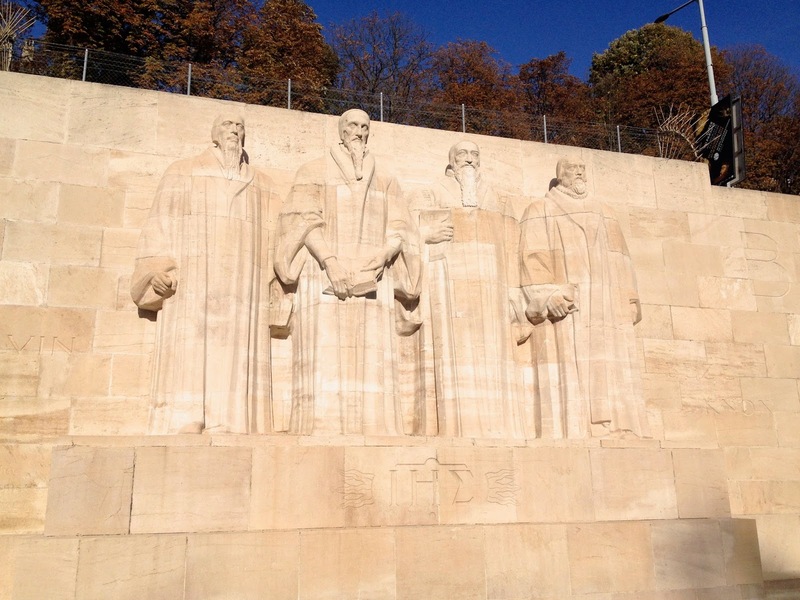 If you take a look at the front of your order of service, you’ll see a photo of the Wall of Reformers in Geneva. The second figure from the left is Calvin, and the one on the far right is Knox. 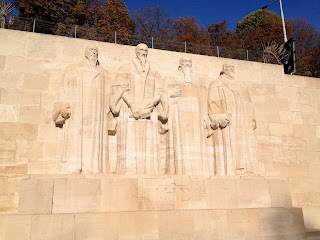 The other two are Genevan theologians who were instrumental in getting Calvin to Geneva, and helping him implement his reforms throughout the church and the city. Looking at these monumental figures, you might notice something: they’re all men with incredible beards. Monuments like this may give the impression that one of the requirements for participating in the reforming of the church is to be male. But while culturally women’s roles were restricted in the 1500s, within the newly reformed church there were a number of women whose work was valuable, or even crucial, to this new thing that God was doing in their midst. Some of those women wrote and published, some did significant pastoral work, and some argued with these giants of theological history. One of the major changes Luther and Calvin brought about was a shift from priests who mediated God’s word and grace to the people, to what they called the “priesthood of all believers.” No longer was scripture limited to a select few, nor was prayer restricted to those who could say the right words in the right place in the right language no one else understood. Confession could be made directly to God, and forgiveness known through the Spirit, not just through a piece of paper purchased from the clergy. The idea that all people, regardless of their status or their educational background or their financial means, could access God was big news. It was a new age, as Jeremiah had said 2000 years before: no longer will there be some who know and some who don't—they will all know God. The covenant of God’s grace, the promise of God’s care, is written directly on our hearts…which means each one of us can know God, and love God, and serve God. From the least of them to the greatest, the prophet says, all will have the word within them…which also means all of us, from the least to the greatest, will be called to live out that word in the world, to do our best to love God with every fibre of our being and to love our neighbour as ourselves. Many of the women leaders during the Reformation understood the priesthood of all believers to mean that they too could and should learn and teach and lead, despite being second class citizens in the cultural and political realm. If it is true that all of us are capable of knowing God, even without reading Latin or being part of the church hierarchy, and all of us are called to faithfulness, then it must also be true that their experiences and their voices were as important to God and to the church as the men’s voices were. In the early 1520s, Argula von Grumbach lived in Bavaria, where even owning Protestant literature, let alone discussing or distributing it, was illegal. She maintained a correspondence with Luther and his colleagues, and she read everything of Luther’s that was printed in German. She wrote open letters to important figures of her day, including the duke, the university president, and city officials. In these letters she offered solid theology grounded in scripture, as a foundation for understanding her experience. She defended the Protestant faith in the face of persecution from the authorities, and insisted that people in positions of power needed to be able to base their decisions in scripture, or to show from the Bible why she or other Protestant authors were wrong. One of her published letters went through fourteen editions in just two months, and in all she sold 30,000 copies of pamphlets and letters. Argula insisted on the priesthood of ALL believers—not just men, not just people with power in the worldly system, not just ordained ministers, but all believers. She knew the word of God backward and forward. It was written on her heart, and she knew that the Spirit was continuing to teach people far better than we could ever teach each other. Like Jeremiah, she felt the word of God burning in her bones and she had to speak—and she paid for it with the loss of her status, her livelihood, and her health. But still she wrote, until the printing presses were shut down specifically to stop her and other women from publishing any further Protestant literature! Meanwhile, in Strasbourg, Katharina Schütz Zell became the most published female lay theologian of the time, an even better bestseller than her compatriot in Bavaria. She was the first woman to marry a minister, and her husband supported her in her ministry both close to home and to the larger world. In addition to ongoing correspondence with Luther, Calvin, and several others—correspondence in which she didn’t just ask for advice or teaching, but also offered her thoughts and her pastoral care to them—she also wrote pamphlets, traveled her parish caring for the poor and grieving and ill, and opened her home to any who had need of hospitality—including hosting many of the big names like Calvin and his colleagues. “Indiscriminate, or downright heretical, in her charity.” I can hear Jesus’ words echo through my mind: the first commandment is to love God with all your heart, soul, and mind—with everything you have, and everything you are. And the second is like it, to love your neighbour as yourself. Regardless of the cost to her reputation, or to her household budget, Katharina loved her neighbour, welcoming them into her home, going into their homes to offer comfort or support or assistance, and encouraging people near and far to love God to the best of their ability, without worrying about whether they had enough money to be forgiven by a priest or whether they were good enough to earn God’s favour. She knew that God is love, and that grace extends to all of us, the least and the greatest, the good and the broken. We heard the prophet: God declares “I will be their God and they will be my people, and I will remember their sin no more.” The good news of God’s love is written on our hearts, or, as the Common English Bible translates it, God will engrave the word on our hearts. Not just a note dashed off in pencil, but engraved—both the covenant and the hearts on which it is engraved are precious, and permanent. We don’t need to worry that God will change God’s mind about forgiveness or grace—we are marked as Christ’s own, loved, forever. Katharina considered herself a “church mother” and felt she’d been called to that role from a young age. When men in the church confronted her with societal expectations of women, she simply told them that God had called and equipped her, just as God calls and equips everyone for their task…and also, she was essentially behaving as a prophet, which is an office that can be borne by men and women, and does not conform to the usual ways of the world. Like Deborah, and Miriam, and Esther, and Ruth, and Mary, and the Samaritan Woman, and so many others, she was using her God-given gift to help others be faithful. It wasn’t an option for her to be silent when there were neighbours who needed to be loved. The same is still true, whatever our place in society or in the church: it isn't an option to be silent when we have neighbours that need to be loved. These are just two of a host of women who lived out the truth of the priesthood of all believers. They, and many others, show us a glimpse of the kind of faithfulness anticipated by the prophet Jeremiah in the days of the new covenant. They don’t get their statues on the wall in Geneva or their portraits in Wittenberg, or even their names remembered in most of our churches, but they are more than just interesting historical tidbits from 500 years ago, or people who get glossed over in favour of the big name men. These women offer us a snapshot of what’s possible when we normal everyday people live as if we believe the good news. The church is not just reformed, but also always being reformed by the word of God, engraved on our hearts by the Spirit, calling us to love as we have been loved. Even when others wish we would be quiet, even when they shut down the printing presses to silence our voices, the truth is that each of us matters, our experience matters, we are all called and equipped by God, and it takes all of us together, from the least to the greatest, men and women, young and old, to be the faithful Body of Christ. *biographical information taken from Kirsi Stjerna's great book Women and the Reformation (Blackwell Publishing, 2009). Knew Hebrew and studied scripture…drew on strong OT women characters as well as the Samaritan woman and the women at the tomb for inspiration/proof of women's call and ability to preach.